In our quest to better understand fishing technology, we’re often poring through Google Patents late at night. Especially after a beer or two. Don’t judge us! Sometimes we stumble across a bit of a mystery. We poke around on the interwebs, but just can’t seem to get an answer. Such is the case of the 1964 US patent #US3123798A, un-inspiringly titled FISH FINDER. Filed in 1960 by Rollind Holloway and John Holloway, the proposed device consists of transducer, a battery, a handle and stethoscope-style headphones. It’s those latter two components that make it less like the portable fish finders we’re familiar with and more like grandpa’s metal detector. By indicating any difference in the frequency of the transmitted energy and the reflected energy the fisherman is provided with information concerning the presence of a moving fish … and is sufficient within a practical range to provide the fisherman with an indication of the presence and general location of the fish within the area scanned. You can almost picture the angler dipping the business end of his newest toy into the water, waving the transducer back and forth, and straining to pick up the slightest fluctuation of the squeal being piped into his ear. If that vision strains your imagination, the patent goes on to make at least one unrealistic claim. With practice the fisherman can determine the approximate size and speed of the fish, which information can be correlated to give the probable identity of the fish. Interestingly enough, the patent does reference quite a few other patents, not least of which is a torpedo echo steering system. In turn, the patent is cited by numerous others well into the 1990s. Beyond the patent info itself, we couldn’t dig up any info about the Holloways (even given Rollind’s unusual name) other than some public record info that points to Rollind passing away in 1971, just a few short years after the patent was accepted. It’s unclear even how Rollind and John were related. What’s even more of a mystery is why the Holloway Fish Finder didn’t, as far as we can tell, go to market. At least in theory, their vision would have been an advancement over contemporary portable fish finders, like Lowrance’s Green Machine which first appeared in 1959, the year before the Holloways applied. 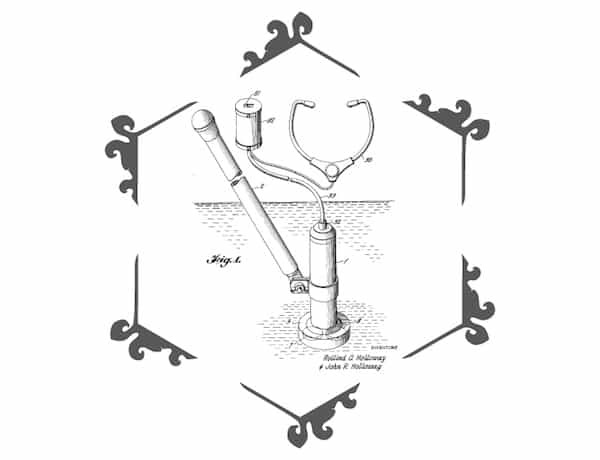 If you have any further info on the Holloway’s invention, don’t hesitate to reach out to us via our contact page. Thirsty minds demand satisfaction! Featured image courtesy Google Patents.